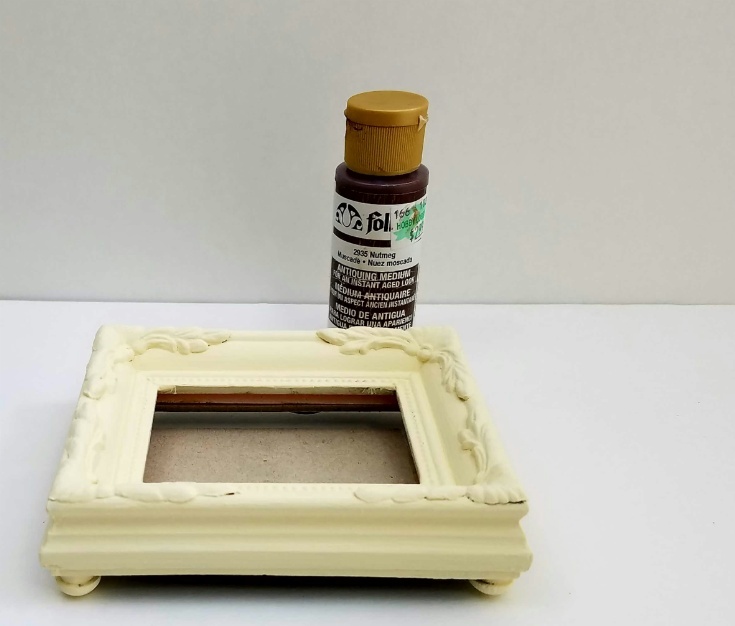 When I ran across this pretty little picture frame I knew if would be the perfect frame for my diy jewelry tray project. First start by finding a cute little wood frame, then removed the glass and cardboard from the frame by opening the window in the back. Then close the little window back in place. I then flipped the wood frame over and glued the wooden plugs in the four corners on the bottom of the frame. 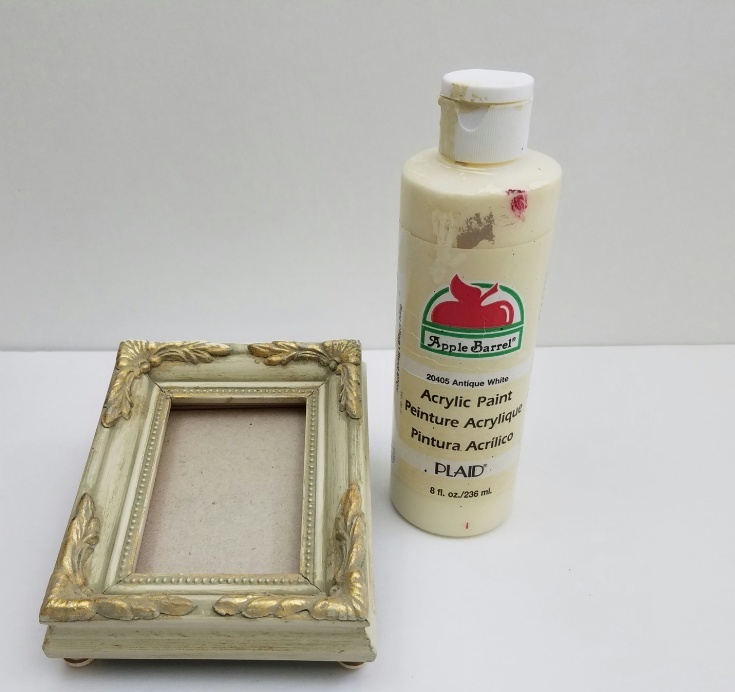 Then I painted the frame, wood plugs and the edges of the back of the frame (cardboard backing) with antique white acrylic paint. 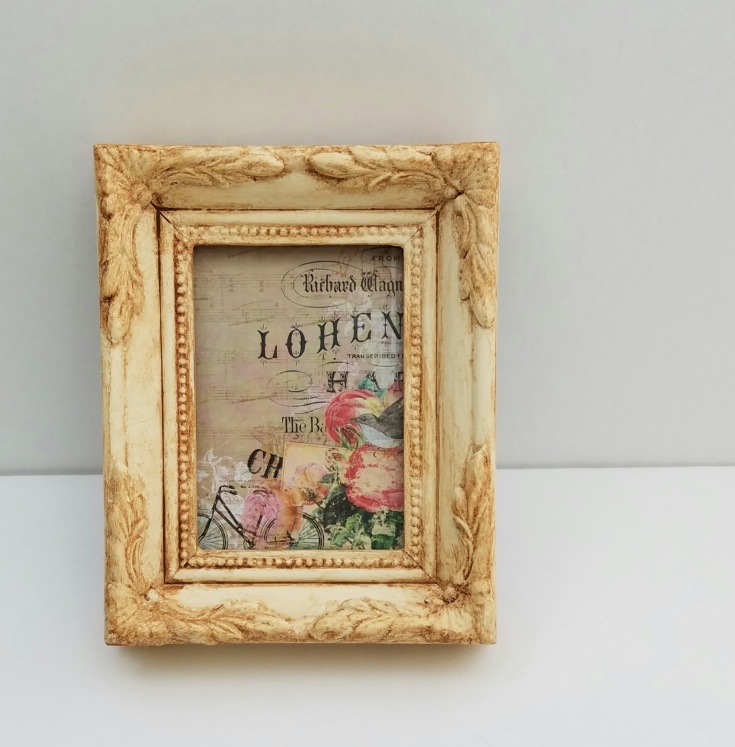 Next I watered down some of my favor antiquing medium and covered the frame by working in sections. Then wiping off any excess till I got the desired look that I wanted. While that was drying I cut my piece of scrapbook paper the same size as the glass from the frame. 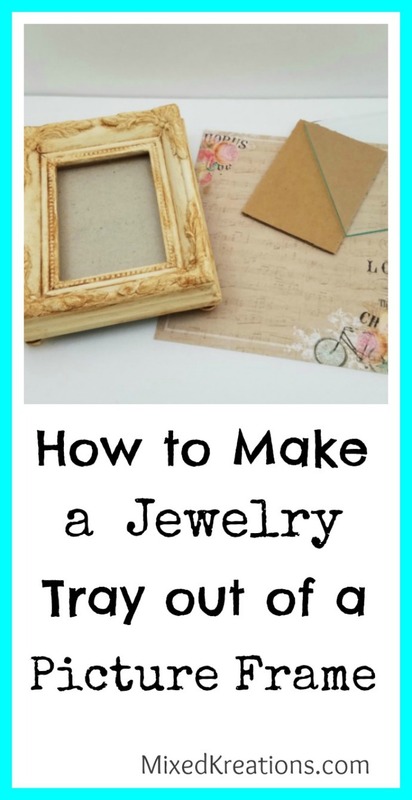 Now it’s time to put the scrapbook paper in the little diy jewelry tray. 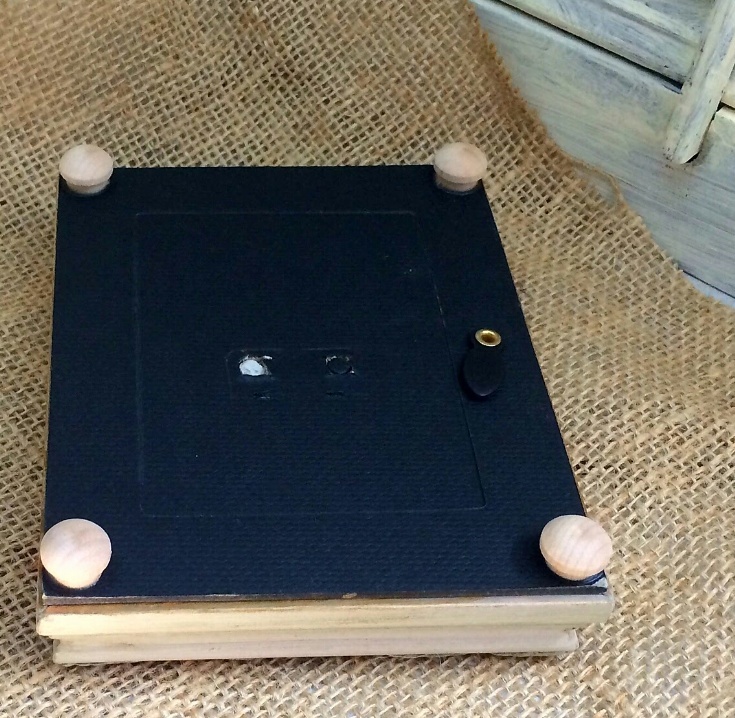 This pretty little diy jewelry tray is great for holding rings and things. 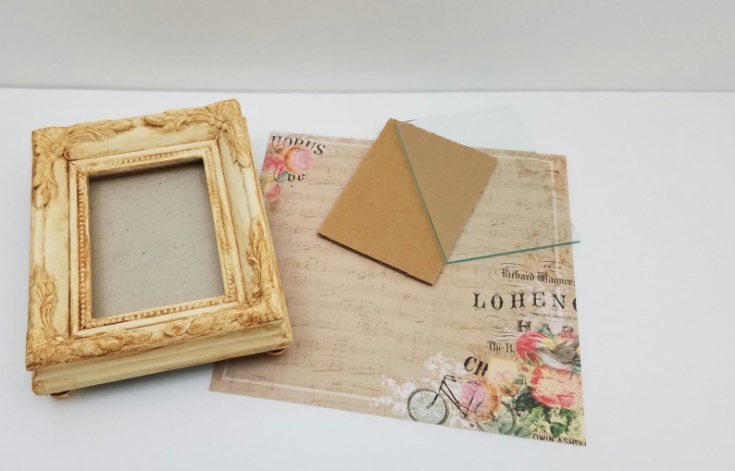 I love how it turned out, and I think that the scrapbook paper looks perfect in the little frame. What do you think? Super cute! I didn’t start using a jewelry case until I got married and needed a place for my rings. Thanks Sarah! 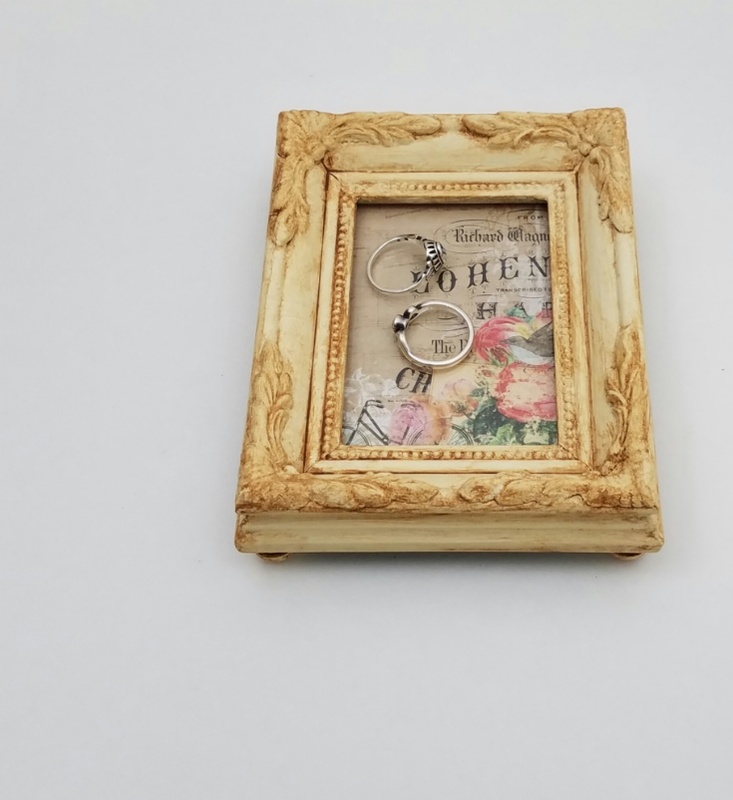 This little frame makes a great place to lay your jewelry overnight. Gorgeous Linda I love the colors you used and that’s such a totally clever and unique way to repurpose a frame. Thank you Michelle! I was debating whether to paint it or leave it like it was and just add the scrapbook paper. I love it and I like the choice of print inside. Thank you Celeste! When I was looking at the scrapbook paper that I had on hand, I knew that was the print for the little frame. Linda, it turned out se perfect! 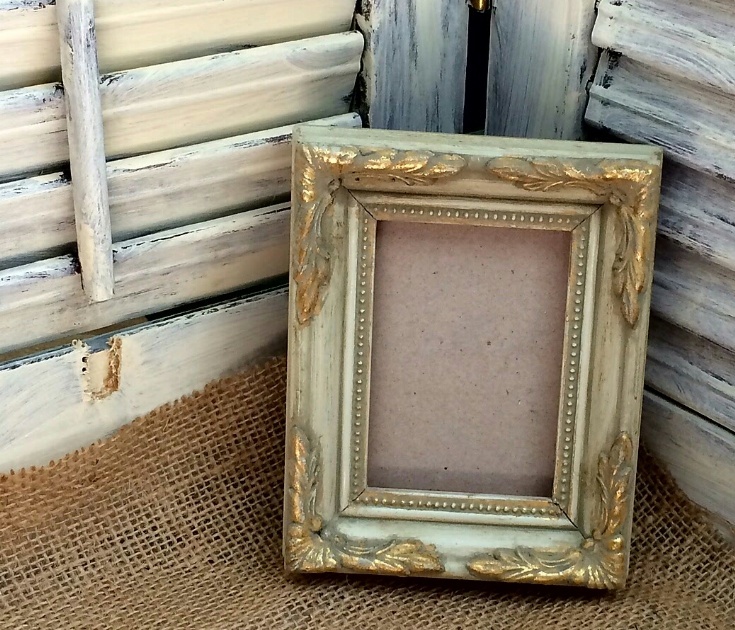 You could use this tutorial and adapt it to any decor, the perfect project. And who doesn’t need a space to corral often used jewelry? I have a jewelry box, but I hate to have to look through it to find the pieces I use most. I want them nearby so I can grab them on the way out the door. This would be a perfect Christmas gift for a man or a woman. You could make it specific to their decor and personality. A teen girl would love this, as well as an older Girl like me. And a man would have the perfect place for his watch, keys and wallet! What a great idea, and Christmas is coming! I better find some frames! Thank you Nikki! Most things that I make go to the craft booth but this was a keeper. I will have to look for more small frames, the Grand daughters may like one. Now for the hubby I would need a large frame he likes watches. Once we get our masterbath finished I am thinking of making a larger and narrow version for the vanity to organize things. Your scrapbook paper is the perfect choice for your pretty tray. What a smart upcycle! You won’t loose jewelry pieces when you take them off. Pinned! Thanks Wendi! While looking through my scrapbook paper that piece was the one that jumped out at me as the perfect piece. That’s for pinning! That’s gorgeous Linda! That frame! Love the paper too. Pinning & sharing. Thank you Florence! I had been saving the paper for something special, and I thought that the frame would be perfect. Thanks for Sharing! What a beautiful project! I am in love with this idea. i have so many frames too. Thank you Maria! I have a pretty good collection of frames as well, and have a tray made out of a frame on my list to make. Thanks for stopping by!